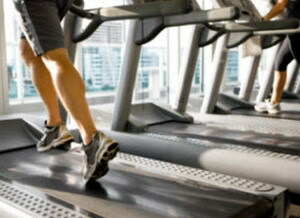 Treadmill is usually a favorite of beginners who are interested in exercise at the fitness center. Anyone can use it without the need for special skills. However, as easy as any kind of sport, you still need to know the correct guidelines. The first step is you have to know what type of equipment you are using. Therefore, before you start using it, you should have a clear knowledge of the working system and the function of the device. You can also ask for help to people who are used to using a treadmill to give an example when walking on it. This is especially true if you have never used it at all. Warm up is the basic thing that you should do when doing an exercise program, before you walk on a treadmill, you have to get the cardiovascular system and the muscles of the body ready for exercise. You can do brisk walking, especially in the morning when the body needs sunlight. After a quick walk, you can gently stretch your leg muscles. This will help you when you start a real workout. One of the most important elements that you should know before running on a treadmill is a look at how to move. Walking on a treadmill is not the same as running at large. Walking on the treadmill gives you an opportunity to assess yourself whether you are doing is correct or not. Of course, this is only noticeable if you use a mirror to see the reflection of the foot during walking on a treadmill. In addition, you can also make video recording practice sessions and analyzed frame by frame. You can also ask the help of a skilled runner and solve your problems. Set the treadmill in a hike position by 1-3 percent, can increase the activity of pelvic floor muscle strength and back of the thigh that will make your muscles are getting stronger, burn more calories and increase stamina. One of the main reasons many people are lazy to do exercise treadmill is the boredom factor. You can avoid the boredom by listening to music or change the schedule and exercise program.